Relieved after seeing that video from Henry's avalanche talk, looks pretty nice up there! Look pretty nice in resort this morning too! 1. Had to go to airport yesterday and flight delayed.... blah blah blah so did not manage to post a photo yesterday - will post three today instead.... see below. 2. no red 27 I am not new to SH - have been on here pretty much every day for a whole year now.... is that new by SH standards - I don't post thousands of times though! 3. I know there are two threads of similar nature but agree as to what others have said in that the other one is very much Tignes focused (which is totally fine). My aim of setting this thread up was SIMPLY to show the conditions in Val daily and give a flavour of what is happening - not really planning in having it a thread that deviates massively into other chat - just simple review of the day blog type entries really. 5. WE HAVE SNOW.... about 5cm fell in town overnight and as you can see from the photos below it looks pretty good up on the Pissailas Glacier this am - the OP was pretty good too today - no face shots yet a while. More snow is forecast over the next 48 hours and I think it would be fair to say we got more than we thought yesterday / last night therefore hope the same thing happens again today / tonight (it has just started to snow again outside my front door) - it is certainly gloomy enough out there! This was the Face illuminated last night when I got back from the airport and it was snowing heavily... the leisure centre in the foreground was really busy last night when I went past - I think everyone had head the snow was on its way and town has really filled up this weekend - most of the tour ops have their first guests this week so perhaps that is why it seems busier. Daybreak this morning and EVERYTHING has gone white - yippee. The lift queues still were non-existant today even though it did seem busier out there. OUr first ski school clinics of the season started today too so there are definitely people in town (www.tdcski.com). A break in the weather and we could see across from the Signal restaurant above Fornet way across to Bellevarde - looks like there may soon be enough snow up there to open that side of the resort and possible the link over to Tignes in due course! About a foot of snow fell overnight up on the mountain and about 20 cm's down here in town..... it is STILL going too. As you can see from the photos it looks like a playground and people have been skiing all the way back down into town.... I would suspect that Bellevarde, the runs down into town and the link over to Tignes will open either tomorrow or the day after AFTER they have had time to compress the snow / piste / bash it (whatever you wanna call it). High winds up high meant the opening was delayed first thing this morning by about 30 mins and as of lunchtime when I came back down the link over from Solaise to Fornet on the 'up and over' as it is affectionally called was still closed. But there was sure plenty of powder to play around in in the Solaise sector this morning even if at times wind and vis was awful. First day of our challenges clinic today and my guys loved the challenge of the pow in zero vis at times. Looking forward to another night (hopefully) of powder - another 30cm is forecast in the next 48 hours - BRING IT ON. Chris H in the foreground here all ABS bagged up could not contain his enthusiasm as the Solaise Express geared up for a slightly later than normal opening.... LOOK EVERYTHING IS WHITE! Just to be sure we took the lift back down as until they piste it I don't think there is QUITE enough coverage to ski into town but by end of tomorrow I am convinced this will be different! This did not stop people getting face shots all the way down into town though! Another 30cm tonight? Which forecast are you using? I'm very excited now, coming out on Saturday for a week with Snoworks. I hope you're right about the 30cm! I'm arriving on Friday, and was starting to get a bit nervous about the conditions! (having assured the Missus Val would be fine by the 9th Dec!). VERY relieved to see all the weekend snow hit! 30cm -------- in the next 48 hours I think you'll find is what I said.... and snow-forecast.com BTW is whom I was looking at but also speaking to the pisteurs this arvo about it to. In fact if you look at Meteo France they are talking about nothing but snow really for the next few days... a short break and more snow next week! Yes it is still snowing lightly and is certainly cold enough. The roads have been cleared today so town is fully functioning and ready for another night of snow - hopefully. Ah yes, so you did. Me getting a little over-excited there. Good news though! Steve Angus, good to see you are keeping this going. 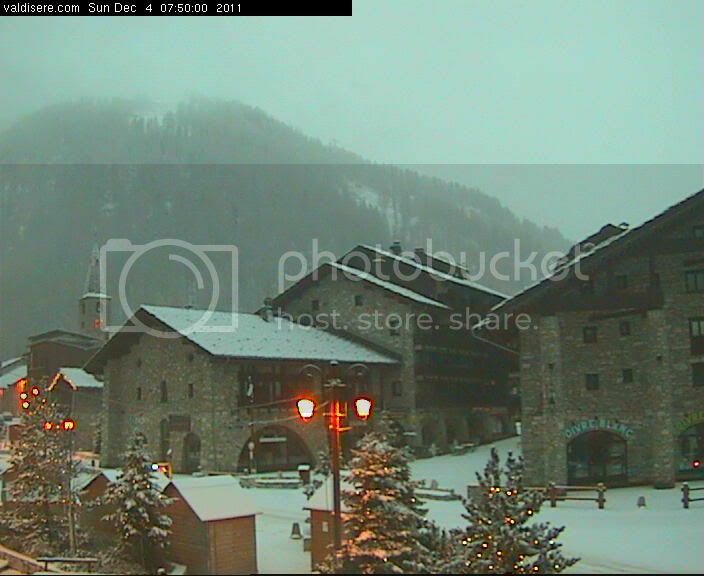 It seems you are getting a better dump up your end than we are down in Les Arcs. Might be up for a ski later in the week. supposedly going to get BALTIC by the weekend though so wrap up warm on transfer day!!!!!! .... just got back in from skiing and it is still pouring down... will post some photos, a report and hopefully some video footage of pow skiing from this morning on the Solaise. Forecasting the snow to keep coming and coming for another 2 days or so - at least another foot. Steve Angus, brilliant news. Hope you have a great season. I'll be out there in March. Cannae wait! Really pleased to see the snow arriving! Did my first season in Val d'Isere so have a massive soft spot for it. Fingers crossed it keeps coming and over the rest of the alps, no one needs another semi bad season, financial melt down!! Well hope you like this video.... I was having too much fun teaching and skiing to get the camera out more than once this am (and it was cold - that is the other excuse!). This footage is just off the side of the blue 'Glacier' run underneath the Glacier Express chair up on Solaise.... thanks to Louise and Martin for sparing me a moment to get this footage of them. It was a great day up there today and the snow keeps coming and coming. Did 3 hours this morning lapping around on the various Solaise lifts skiing powder everywhere. I reckon there has been about 2 foot in some pockets since the snow started falling a few days back. All the pistes had perhaps 10cm of new snow from last night and as you can see from the photo there is loads in town and snow tyres / snow chains are pretty much required on all vehicles now. The forecast is good too - another 30cm (again) still to fall in the next 36 hours... by the looks of things Thursday is going to be mega BUT please be careful out there. Please check out http://www.henrysavalanchetalk.com/ to learn how to stay safe out there. Due to the fresh snow, the need for consolidation, the avalanche risk etc; again it was pretty much one choice - Solaise or nothing today. They were putting the cars on the Olympique this afternoon test running it therefore I am sure tomorrow it will all open up, and the whole Bellevarde / La Daille massive. Likewise the runs into town will probably open up tomorrow and it would suggest that perhaps the links to Tignes - anyway it is still weather dependent and nothing firmed up yet! Woop woop, that looks amazing, can't wait until Saturday! Hi all, just signed up to view factual snow reports instead of the nonsense spouted by tourist boards! Excellent news, am heading out on Saturday with Snoworks. Going to get the photos and perhaps video up again later on but to whet your appetite today was perhaps one of the best days skiing of my whole entire life - we have had so much powder that we are drowning in it now! perhaps one of the best days skiing of my whole entire life - we have had so much powder that we are drowning in it now! I like the weather post and hope the predictions are correct, but I think we will be lucky based on other weather charts if we get half that amount. It seems it was twice that amount. Lucky indeed. From the models, it seems tomorrow is going to be an even better day to ski... bluebird. Steve Angus, Thanks for this thread. Keep it coming. I think that on-the-spot info like this is one of the best features of snowHeads. You are all sooooooo lucky!!!! I'm not out until Jan......I hope it last until then!!!! snow absolutely mental here.weve been here three days and it hasnt stopped.cars outside our fabulous chalet mistral absolutely covered. Be safe and if you can't be safe, be lucky! CRAZY is the word of the day! Not the best photo (and not directly out my window) but that blurry car is SMALLER than that mound of snow it is driving by! The day started with a late opening because of the new snow which the resort reckon was about a further 50cms on average over night. Initially only the Solaise was open but little by little other stuff begain to open and the link to Tignes was by all accounts opened later in the afternoon. There was so much snow that after pretty much every turn today I had to spit out another faceshot. I would have to say that after skiing in 12 countries around the world over the last 30 years and probably a hundred resorts and THOUSANDS of days on the hill (teaching and non-teaching) that this was one of my favourite days EVER. The vis was not the best, the wind was strong at times but WOW was the snow deep and light. we woke to a very snowy scene. They have started to implement the peda avalanche plan and no pedestrians are allowed between town and La Daille, town and Le Fornet etc etc. If it carries on like this then the road to traffic will become closed and we may even end up with a black flag day tomorrow. The forecast for tomorrow is for the snow to stop, the wind to lighten and the sun to come out. It could be a bluebird day and THAT would be mighty special... HOWEVER the avalanche danger will be huge so fingers crossed everyone stays safe out there. There was an avalanche today in Saas Fee whereby (by all accounts) a slide came across the piste that an instructor and his / her (junior) client were skiing along - she was buried for 45 mins... that is all I know! Keep checking pistehors.com and Henrys Avalanche Talk websites for more info. There was an avalanche today in Saas Fee whereby (by all accounts) a slide came across the piste that an instructor and his / her (junior) client were skiing along - she was buried for 45 mins... that is all I know! Just WOW! I'd love to have just once chance in my life in conditions like that. In 22 years of skiing it hasn't happened yet. HUGE thank you to you for your updatesver the past few days. They have kept me sane in what as been an otherwise pretty crappy week, knowing that I'll be out there tomorrow!! I hope you have a fantastic season. Stay safe out there. Steve Angus, fantastic reports! You lucky, lucky man! Stunning day. looking forward to photos from Steve Angus today!